Female; 20 – 27 years old; Must be 5’2” in height; BS or Associate degree in HRM or other hotel related course; With excellent communication skills, a positive and persuasive personality; Fluent in English both oral or written; Well-versed in MS Excel and MS Word; Knowledgeable in handling Front Office operations; Should be able to work during major holidays; with at least one(1) year experience in the same field; With good guest relation skills; Physically and mentally fit. Male; 21 – 45 years old; Preferably with Associate Degree in HRM / Culinary or any related short terms courses or equivalent; Must be able to work efficiently under pressure; With at least two(2) years related experience as Cook or Assistant Cook with familiarity of Asian Cuisine. Female; 22 – 28 years old; BS Accountancy graduate; Minimum of one(1) year experience of progressively responsible accounting experience, especially in a Hospitality industry; Good leadership quality, self-driven, meticulous and goal oriented; Well-versed in various computer application especially in MS Excel; With excellent communication skills in English; With honest and trustworthy attitude; Can work under pressure and willing to extend long working hours during peak workloads such as month-end, year-end and special project. Male/Female; 22 – 27 years old; Graduate of BS HMR, marketing or any Business course; Experience in customer relations and inquiries management preferred but not required; Minimum of one(1) year experience on Sales and Marketing especially in a Hospitality industry; Pleasing personality; Good command of English, oral and written communication, strong leadership and interpersonal skills; Good working knowledge of Microsoft Windows Office. Male; At least 18 – 27 years old; Graduate of any 4 year course, College level or Vocational courses on Hotel and Restaurant Management; At least one(1) year experience in hotel industry; Good communication, PR and sales skills; Must possess a pleasing personality; With honest and trustworthy attitude; With excellent communication skills in English; Ability to multi-task and work well under pressure in a fast-paced environment; Knows how to drive is an advantage. Female; 20 – 27 years old; 5’4” in height; Preferably with at least one(1) year experience in the same field; Graduate of Hotel and Restaurant Management or any Business course; With excellent communication skills in English, both oral and written; Must possess a pleasing personality; Can work under pressure. Male; 25 – 35 years old; Preferably with at least two(2) years experience in the same field; Graduate of any course (college / Vocational); With average communication skills; Knowledge in Manila / Clark route; Can work under minimal supervision; Physically fit. Male; Must be 25 – 30 years old; College level or experienced Employee specializing in Security / Armed Forces / Protective Services or equivalent; Honest, hardworking, flexible and can work with minimum supervision; With good moral character; Able to communicate effectively; At least 3 years experience in the same field under Hospitality industry; With excellent leadership skills and can tactfully convey the company’s security concerns with persons within and outside the organization; Knows how to drive is an advantage; Physically fit. Must have experience in the field of work; Must be fit to work; Must be responsible and hardworking; Can work with minimum supervision;. 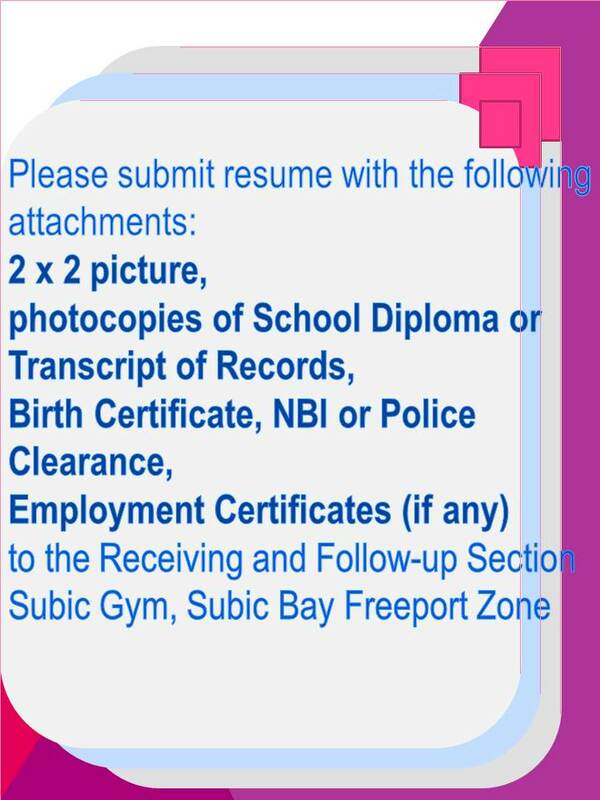 Male; Must be 24 – 40 years old; Graduate of any Technical / Vocational skilled courses or TESDA Training skills ( Forklift operation and repair preferred) or at least College level of any course; Experienced and/or have vast knowledge in general warehousing procedures (loading and unloading to/in the container); With a little carpentry knowledge ( non-essential); Knowledge in general safety procedures in forklift operations and warehousing (Trainings attended); Must have a legitimate driver’s license for forklift / heavy equipment category; Must be physically fit and full of energy. Male, not more than 35 years old; At least high school graduate; With driving experience and knowledge is an advantage; With good moral character; Must be hardworking; Willing to work beyond normal working hours. Male, not more than 35 years old; At least high school graduate; With knowledge and experience in gardening; With good moral character; Must be hardworking; Willing to work beyond normal working hours. Male, not more than 40 years old; At least High school graduate; Must have knowledge in autodiesel mechanic (Heavy equipment engine, hydraulic pump, automatic transmission); Sufficient know-how in machine shop technology; With good moral character; Hardworking and can work beyond normal working hours. Male, not more than 35 years old; At least High school graduate; With knowledge in automotive fuels, oils and lubes; With good moral character; Hardworking and can work beyond normal working hours. Male, not more than 35 years old; At least high school graduate; Must have knowledge in driving vehicles, experience in driving trucks is an advantage; With good moral character; Must be hardworking; Willing to work beyond normal working hours. Male, not more than 40 years old; At least High school graduate; Must have adequate knowledge in automotive electricity (trucks and heavy equipment); With good moral character; Hardworking and can work beyond normal working hours. Male / Female, not more than 35 years old; Graduate of BS Accountancy; With minimum of 2 years experience in auditing work; Can prepare financial analyses and audit reports; Must have adequate knowledge in BIR and other government regulating agencies’ reportorial requirements; Possesses good analytical skill, result-oriented and with high sense of responsibility; Good in oral and written communication skills; Computer literate using Windows Application; Knowledge in computerized accounting system would be an advantage; Hardworking and can work beyond normal working hours. Female; 20 – 30 years old; BS Accountancy graduate; Must be a Certified Public Accountant (CPA); With or without experience.